I confess that I am not well-versed enough in recent Chinese history to know when the first western restaurant chains started opening locations. I can’t imagine that it’s been more than 20 years or so, and it’s rather staggering if that’s the case, because you can’t go five minutes without tripping over a McDonalds or Dairy Queen or Starbucks. 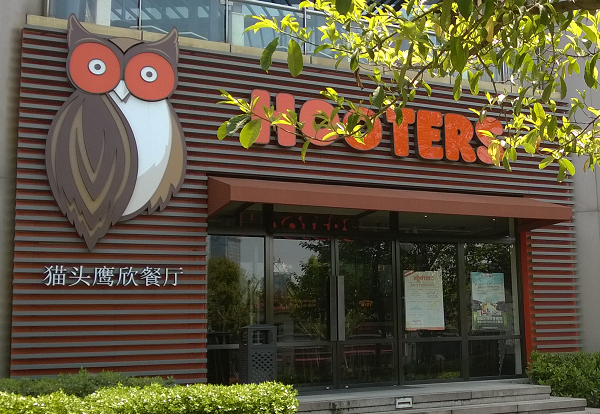 Despite the ubiquity of those recognizable brands, I was a bit taken aback when I walked past two separate “Hooters” restaurants in the space of one day of wandering Shanghai. I’d never been to one, but it’s not that I have anything against the establishment. From their reputation, they’ve always struck me as similar to maid cafés, really, in that you go to them to be served by cute girls in very specific uniforms and eat overpriced food. Hooters DOES have a bit of an Enforced Fun vibe about it, though, and that’s not really my thing, so I’ve never felt compelled to go to one in the states. On the other hand, seeing the chain in China made me terribly curious. The success of Hooters, as I understand it, is based on hiring servers with a very specific phenotype – and, without getting TOO crass, a phenotype not well represented throughout most of Asia. After some soul-searching, I decided that it was my sworn duty to investigate and report back to my readers. To answer the question on your mind at this point in as oblique a fashion as possible, there is an entrée on the Hooters menu called the “Double D” Burger. In case one were to miss the point of the name in question, it appears on the menu directly next to words proclaiming that Hooters is “more than a mouthful”. I am sad to report that this was hopelessly optimistic on all counts. It’s not that the staff wasn’t TRYING, but there’s only so much you can do with what nature hasn’t provided. I’m probably going to hell for that observation, so let’s just ensure the trip with the recommendation that this particular burger should probably be called the “Double B” in China. The burger and a soda set me back 元144, or $29, making it the most expensive meal I’d had in China, but it WAS a very tasty, VERY American-style burger. After the visit, I was left with an odd sense of national pride. At this point, I’d been in China for three days and absolutely stunned by the sheer drive on display. Shanghai is BOOMING, with new construction everywhere you look and a general sense of raw hustle about it, and as a westerner, it’s hard not to feel a little inadequate. On the other hand, I feel confident that, if I were to walk into a Hooters in the US, the restaurant would live up to its name in spades. So we’ve got that going for us, at least. As a followup, I undertook the same experiment at the Beijing branch of the chain, with similar observations as to the appropriateness of the brand name. The staff at the Beijing store were really friendly, however, and either really enjoyed their jobs or were just amazingly good at faking it. Poor fan-service, sure, but tremendous customer service. As a followup to a followup, I then returned to Shanghai and I went to the second Hooters location, near the city library, and I can confirm that the burgers are just as tasty and that the staff turns the HOOTERS MAKES YOU HAPPY attitude (it’s a motto?) up to 12 compared to Beijing’s 11. Also, since I was in on lunch and the place was pretty empty except for me, a couple of folks on their lunch hours, and a family having a birthday party for a little girl of about 5, I got mobbed by employees looking for English practice. I am not complaining about this in the least – there have been times in my life when being made to stand up in a circle of eight strangers and sing silly songs would have left me embarrassed beyond the point of coherent speech, but apparently I have transcended shame.